Why Should You Wear a Sports Mouthguard? In sports, physical fitness and injuries go hand-in-hand. It’s common knowledge that contact sports like football and basketball have a higher risk of serious injuries, like tendon tears and concussions. But orofacial injuries can also occur, and may be quite serious. Dentists recommend that amateur and pro athletes alike wear a sports mouthguard during each game and training session. 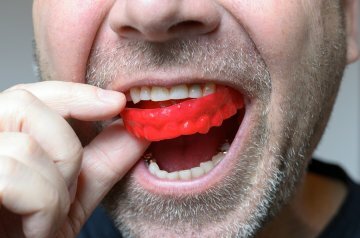 In an informal survey, 67% of parents said that their children don’t wear mouthguards during sports activities because they aren’t required to do so, according to the American Dental Association (ADA). Unfortunately, the failure to wear mouthguards means that these young athletes are 60 times more likely to sustain an orofacial injury. Given that many types of sports equipment easily run into the hundreds of dollars, a well-made sports mouthguard is among the least costly ways to protect an athlete’s health. Dental injuries can occur when two players collide, a player falls down, or a player is struck by an object, such as a football helmet or ice hockey skate. Virtually any part of the face and mouth can sustain damage, including the jawbone, which may sustain a fracture. Soft tissue injuries can occur, including trauma to the cheeks, lips, gums, and tongue. And of course, the teeth can sustain damage from physical trauma. Athletes are known to be at a higher risk of chipped, cracked, and fractured teeth, as well as tooth avulsion. An avulsed tooth is one that has been completely knocked out. Mouthguards are usually mandatory for athletes who play sports in which collisions are likely, such as football, boxing, and hockey. Other sports teams might not require mouthguards, but they should. These sports include basketball, softball, wrestling, baseball, soccer, volleyball, and lacrosse. Even cyclists can benefit from wearing a custom-made mouthguard, as a tumble from a bike can easily knock out a tooth. At Glenwood Premier Dental, you’ll find a complete range of preventive oral care services, including custom-made sports mouthguards. Our dentist will precisely mold the appliance to fit your teeth to provide maximum comfort and protection. Get in touch today at (732) 264-4477 to request a dentist visit in Hazlet.